Raising the Stakes provides an understanding of the breadth of resources that are needed in order to provide a quality education to all students so that every individual, organisation and institution can become a stakeholder in the enterprise. spiritual capital, which can be viewed in a religious sense or in terms of the culture and values that bring coherence and unity to these endeavours. The authors also outline a Student-Focused Planning Model with particular attention to the deployment of resources to support each student and embracing the notion of personalising learning. Practitioners and researchers reading this book will be inspired to work more closely in networking knowledge about how ‘high quality’ and ‘high equity’ can be achieved. 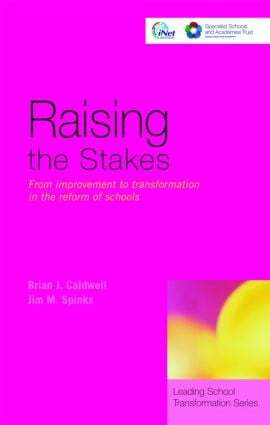 Raising the Stakes is essential reading for those with the responsibility of ensuring that resources are acquired and allocated to achieve the best possible outcomes for students.